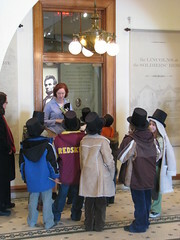 On January 23, 2008, Hearst Elementary 3rd Graders, their teacher, Mr. Rope, and librarian, Elizabeth Vandivier, visited President Lincoln’s Cottage. Mr. Rope’s class was the second class to visit the site after restoration work was finished and prior to the grand opening, which meant they were one of the first groups to get the full experience at President Lincoln’s Cottage. 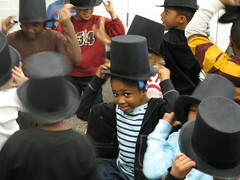 The students participated in “Lincoln’s Hat,” a new program about Lincoln’s writing process developed by Curator of Education Jill Sanderson. The program meets standards of learning in DC, Virginia, and Maryland. 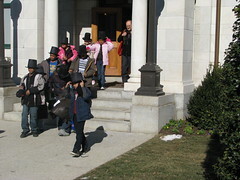 For more information on this and other programs see: http://lincolncottage.org/visit/education/. 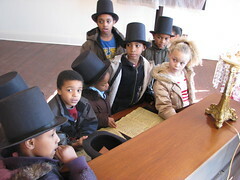 As part of the visit, students toured President Lincoln’s Cottage. They learned about why Lincoln came to the Soldiers’ Home and about Lincoln’s Emancipation Proclamation, which he began working on his first summer here in 1862. “We had a special opportunity last week to go to President Abraham Lincoln’s cottage at the Soldiers’ Home on Rock Creek Church Road. The cottage hasn’t opened to the public yet, and we were only the second school class to visit. We look forward to welcoming many more students to President Lincoln’s Cottage in the coming months. Ms. Erin Mast is Curator at President Lincoln’s Cottage. Special thanks to Mr. Rope’s Third Grade Class from Hearst Elementary for allowing us to publish their essay and share photos of their visit.